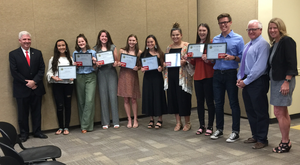 2018-19 Teacher of the Year FINALISTS! 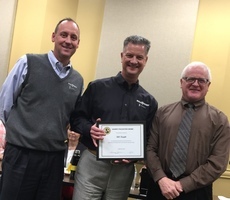 At the January School Board meeting, the Sand Springs School district awarded Bill Knight with the Sandite Pacesetter Award. 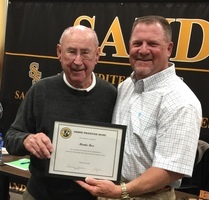 The award was given in recognition of Mr. Knight's continued support of Sand Springs Public Schools. 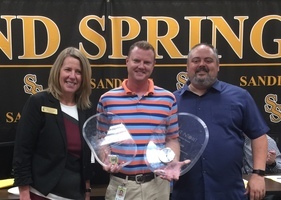 To date, Bill Knight Lincoln has donated $45,520.00 in support of Sand Springs Public Schools. 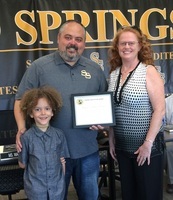 On Monday, January 7th, the Sand Springs School Board welcomed a new member. 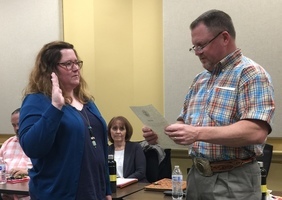 Whitney Wagers, shown here, is sworn in by Board President Bo Naugle. 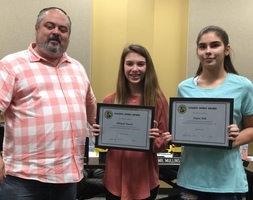 Mrs. Wagers will assume the seat for Board Office #1, which was previously held by Krista Polanski. 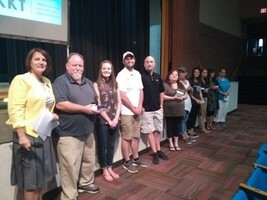 2018-2019 Site Teachers of the Year! 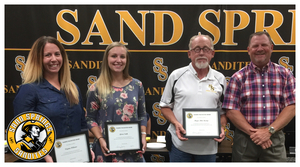 On Monday, November 5th, the Sand Springs School Board recognized the Sandite Volleyball Team as 6A Academic State Champion for 2018. 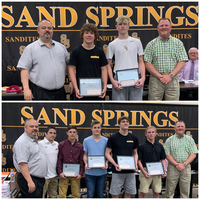 The team is shown accepting their Sandite Spirit Awards alongside Coach Dylan Cahwee. 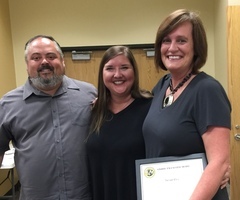 Susan Cox, (far right pictured with School Board Member Rusty Gunn and Carrie Schlehuber) is awarded the Sandite Pacesetter Award. 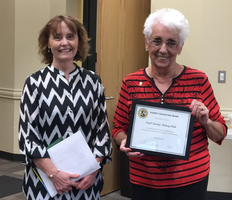 Susan was nominated for her lifesaving efforts in donating a kidney to Mrs. Schlehuber. 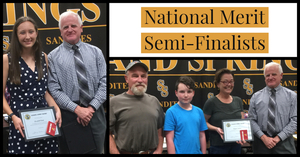 Her selfless act of love and bravery is a great example of a #SanditeHero in action! 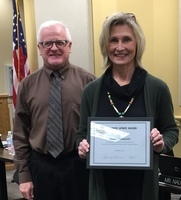 Sheila Bright of Bright Morning Farm accepts the Sandite Pacesetter Award from school board President Bo Naugle. 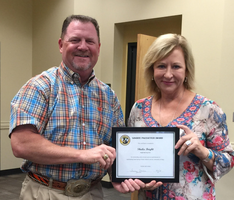 Sheila donated the use of the event center at Bright Morning Farm for the District Leadership Retreat. 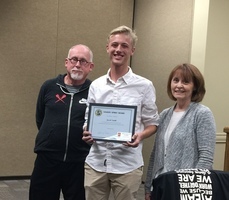 Gerrie Holladay, Sand Springs Rotary Club President, accepts the Sandite Pacesetter award on behalf of Rotary. 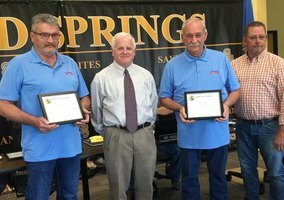 The Sand Springs Rotary Club collected gift cards from area businesses to purchase school supplies that were donated to Sand Springs Public Schools. 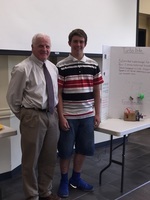 Pictured with Gerrie is Board Vice President Jackie Wagnon. 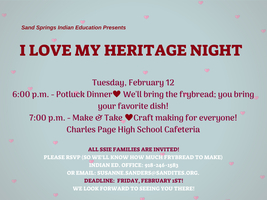 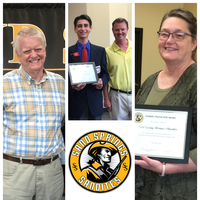 Did you miss our Sandite Heroes today? 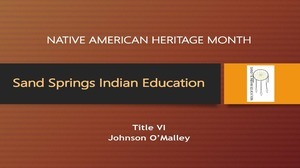 Catch the #sanditehero video via this link! 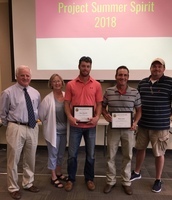 Board Member Mike Mullins (left), Architect Jeanie Kvach (second from left), and Maintenance Director Michael Bynum (far right) recognize Tremco Roofing for their outstanding service in keeping a roof over our buildings and keeping us dry. 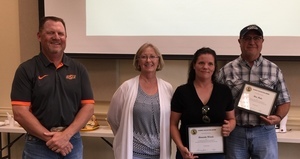 School Board Member Bo Naugle (left) and Architect Jeanie Kvach (second from left) recognize HVAC technician Amanda Woods and owner Ron Hale from ECT Services for their years of service in keeping the district cool. 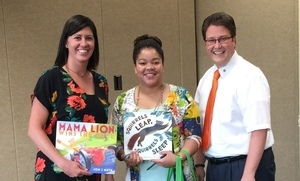 Sand Springs City Councilman, Brian Jackson donates books from the Library of Congress booklist to Principal Laura Hamilton of Northwoods Fine Arts Academy and Principal Joey Bean of Pratt Elementary School. 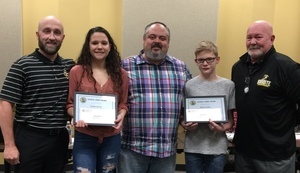 Heather and Raymond Douglas are recognized here by Rusty Gunn, School Board member, for their generous donation of $2500 to CPHS and $2500 to Garfield STEAM Academy. 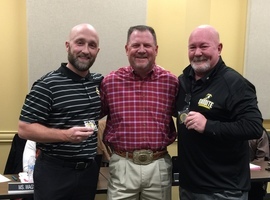 The Sand springs school board recognizes McIntosh Services for work done to Central Ninth Grade Center.